(WXYZ) - Finally, thanks to research, we all may be able to find one person who has been eluding us for decades. That's right, we're coming for you, Waldo! A local Ph.D. candidate has developed the ultimate search strategy for Where's Waldo? The classic books that we all know and love may now have a formula. 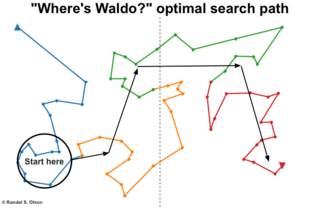 Randal Olson, a computer science graduate research assistant at Michigan State University, says on his blog that he was snowed in one day, and decided to come up with the optimal search path to find Waldo. I think we can all relate to being snowed in here in Michigan and coming up with some pretty crazy ideas. 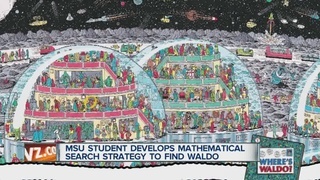 Randal first studied a map of all 68 of Waldo's coordinates in the primary seven editions of Where's Waldo books. 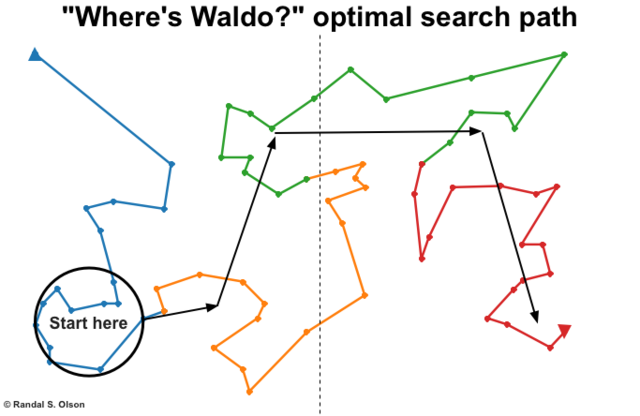 Then he used a genetic algorithm to come up with the optimal search path to Waldo's possible location. That specific algorithm tries something slightly different each time until it finds the best solution. Bottom left is a good place to start, then upper quarter of right page and then bottom right half of the right page. Randal says it was all in good fun--and said no sane person was around at the time to tell him to solve bigger world problems--but I think it's great.